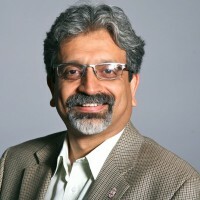 Nitin P. Padture is the Otis E. Randall University Professor in the School of Engineering, and Director of Institute for Molecular and Nanoscale Innovation, at Brown University. Prior to January 2012 he was College of Engineering Distinguished Professor at the Ohio State University (OSU) in Columbus, and also the founding Director of the NSF-funded Materials Research Science and Engineering Center (MRSEC) at OSU. Padture received his B.Tech. in Metallurgical Engineering from Indian Institute of Technology (IIT), Bombay (1985), M.S. in Ceramic Engineering from Alfred University (1987), and Ph.D. in Materials Science & Engineering from Lehigh University (1991). He was a postdoctoral fellow at NIST (Gaithersburg, MD) for about 3 years, before joining the University of Connecticut (UConn, Storrs) faculty in January 1995 as Assistant Professor. He became Associate Professor in 1998 and Professor in 2003. He served as Interim Department Head at UConn before moving to OSU in January 2005. Padture’s research interests are in the broad areas of advanced ceramics and nanomaterials used in applications ranging from jet engines to solar cells, impacting transportation, energy, and defense sectors. Specifically, he has active research in: (i) advanced structural ceramics, composites, and coatings for mechanical, thermal, and optical properties; (ii) hybrid perovskites and photovoltaics; and (iii) functional 1-D (nanowires, nanotubes) and 2-D (graphene, thin films) nanomaterials and devices. Padture has published over 200 papers, which have been cited over 13,000 times (Google Scholar), and he has delivered over 200 invited/keynote/plenary talks. A Fellow of the American Ceramic Society, he has received that society’s Roland B. Snow, Robert L. Coble, and Richard M. Fulrath awards. Padture is also a recipient of the Office of Naval Research Young Investigator Award and he is a Fellow of the American Association for the Advancement of Science. He received the Distinguished Alumnus Award from his alma mater IIT-Bombay in 2017. Having served as a Principal Editor of Journal of Materials Research and an Associate Editor of Journal of the American Ceramic Society, Padture also served as a Guest Co-Editor for MRS Bulletin and RSC Physical Chemistry Chemical Physics. Currently he is Editor of Scripta Materialia (since 2012) and Acta Materialia (since 2017).